The loss of a loved one can often feel unbearable, leaving behind a huge hole in our lives. For the past seven years, Swan Bank Church in Burslem has hosted a special Bereavement course, tailored to support individuals through times of mourning. 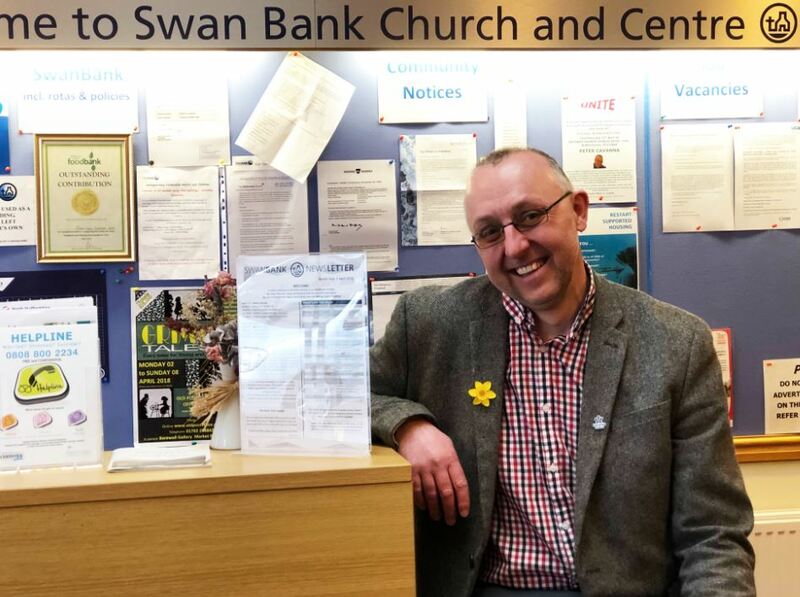 Last week, Saltbox sat down with Rob Kellett, Swan Bank’s Pastoral Co-ordinator, to learn more about his role in the church and how their bereavement course is supporting those affected by loss. Thanks for inviting us down to Swan Bank, Rob. First up, would you like to tell us a little about yourself? Sure. My name is Rob Kellett and I’m 47 years old. I was originally born in Yorkshire but never lived there. Instead, I was bought up locally in Alsager before moving to Harriseahead. I’ve been married for the past fourteen years and we have a twelve-year-old son. I’ve worshipped at Swan Bank for nearly twenty years and have worked here for the past seven years. I’m the Pastoral Co-ordinator at Swan Bank. I love doing what I do. My focus is mainly on people. We have a large congregation here. In my role, along with a few other volunteers, we go out and visit people in their own homes, or in the hospital when they aren’t very well, providing comfort and support. Before joining Swan Bank I used to work for John Johnson Funeral Directors in Tunstall. From a Christian context, there are elements from my old job which I’ve been able into adapt to Swan Bank’s bereavement course. Saying that, the course is just as applicable to those from a non-faith background. How did the Bereavement course come about? About seven or eight years ago I was shopping at Tesco in Kidsgrove and saw an A4 leaflet on their notice board. It was advertising a bereavement course that was taking place at St Martin’s, Talke. I went home wondering if it was something we could adapt for Swan Bank. My wife then mentioned a lady from our congregation, Margaret, who’d recently lost her husband. In the end we all went along to St Martin’s. Margaret was able to benefit from their support while I was able to learn more about how the course operated. The people running the course were lovely and it was certainly something we could replicate in a Swan Bank context. We’ve been doing it ever since and this is now our seventh year. What does the Swan Bank course involve? It’s very much a group session. Everyone who attends has had a significant bereavement. Generally, we have two speakers who faithfully run through the presentation material. The course is done over six weeks. We use a venue upstairs in Swan Bank. It’s a fantastic, comfortable, modern space to work in. The first week of the course is a little shorter and acts as a taster session where people can see what the next five weeks are going to involve. There’s no obligation to do the next five weeks, although of course we’d like everyone to stay for the duration. There’s also group work and activities involved where people can share experiences. It’s fair to say that the course isn’t all serious, there are some laughs within it – we do want to lighten the mood where we can. Rapport and friendships soon develop. The great thing is people are all in the same boat and there’s a commonality in that. I’d say all who have suffered a bereavement and feel they’d like some support to get through it. Death is a common experience for everybody. When you lose someone special it often leaves a large and untimely gap, so you want to help at a very vulnerable time in people’s lives. We support people from both faith and non-faith backgrounds. Thanks for your time Rob. Do you have any final words on how people can get in touch? I think it’s a wonderful course with a proven track record of helping people who are really struggling with elements of bereavement. About 50 people have been through the course since it first started. If you’d like to find out more then please contact me, Rob Kellett, either through the church office on 01782 575129, or send me an email at rob.kellet@talktalk.net.